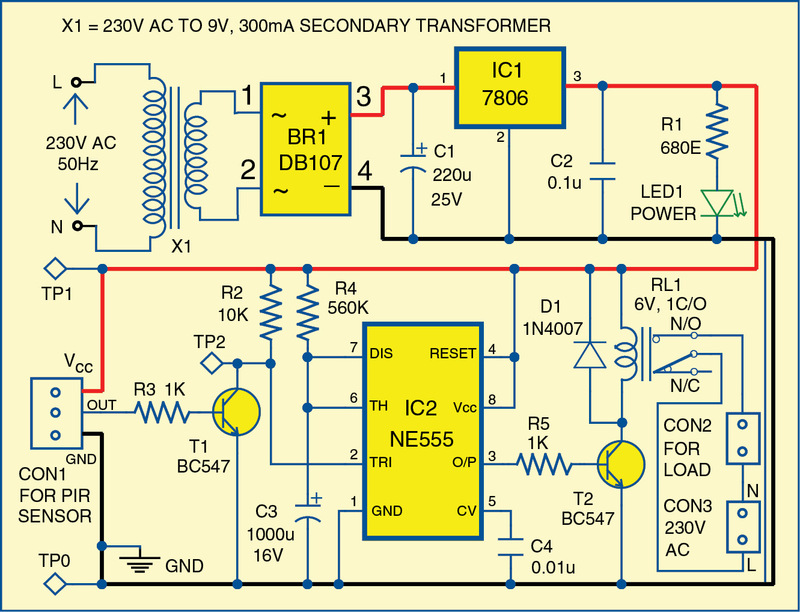 This circuit is based on a passive infrared (PIR) sensor, which automatically switches on a device when someone comes close to it. It can be used for detection of theft or an unauthorised person entering a restricted area or building. It can also turn on lights when someone approaches the area where it is installed. 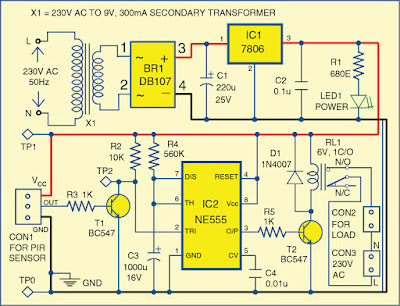 Applications of this circuit include security systems, corridor lights and bathroom lights, among others. 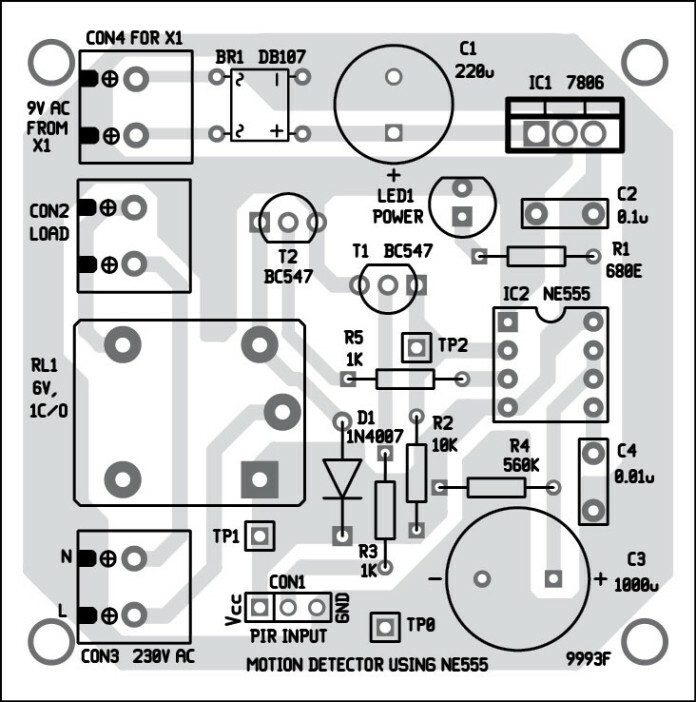 The circuit diagram of the motion detector using NE555 timer is shown in Fig. 1. It is built around 230V AC primary to 9V, 300mA secondary transformer X1, bridge rectifier DB107 (BR1), 6V voltage regulator 7806 (IC1), timer NE555 (IC2) and a few other components. The 230V AC mains is stepped down to 9V, 300mA through step-down transformer X1. Secondary output of X1 goes to bridge rectifier BR1. Capacitor C1 filters the ripples and the rectified output is given to regulator 7806 (IC1). IC1 provides 6V regulated DC output to operate the circuit. LED1 is used as a power-on indicator. IC2 is configured in monostable mode. 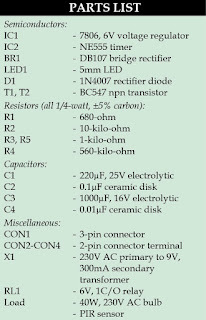 Time period of IC2 is based on resistor R4 and capacitor C3, which is around ten minutes in this case. By changing resistor R4 and capacitor C3 you can change the time period of IC2. Output pin 3 of IC2 is connected to the base of relay driver transistor T2. Contacts of relay RL1 are connected to the load, which could be a CFL or a bulb connected across CON2. The PIR sensor is a pyroelectric device developed for detection of human body infrared radiations. 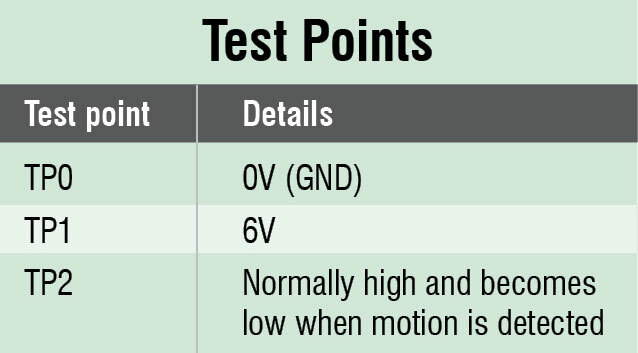 It has a single output that goes high when a valid motion is detected. That is, the load is switched on whenever the PIR module senses a body in motion nearby. 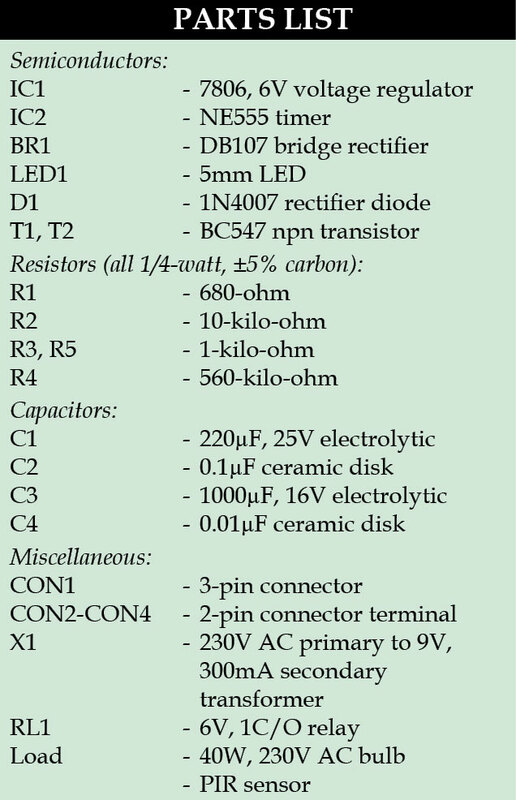 Under normal conditions, transistor T1 is cut off and collector output is high around 6V. When motion is sensed, output pin (OUT) of the sensor becomes high, making transistor T1 to conduct for a few seconds, and voltage at its collector goes low momentarily. This low signal triggers IC2. Output pin 3 of IC2 goes high for around ten minutes, energising relay RL1 through transistor T2, turning on the load for ten minutes. In brief, when someone comes in front of the PIR module, its output triggers IC2 to turn on the load. Thereafter it is disabled automatically. 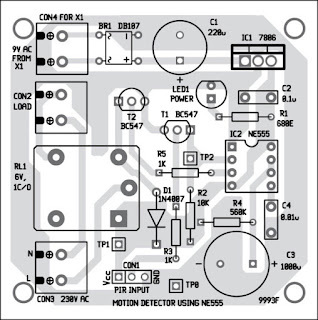 An actual-size, single-side PCB for the motion detector using NE555 timer is shown in Fig. 2 and its component layout in Fig. 3. 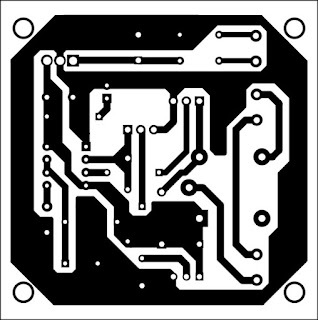 Enclose the PCB in a box and install it at a suitable location. Connect the PIR module across CON1. Connect transformer X1 to 230V AC mains. 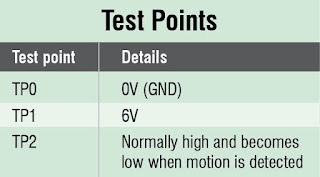 Verify various test point voltages as given in the table to ensure proper working before using the circuit.